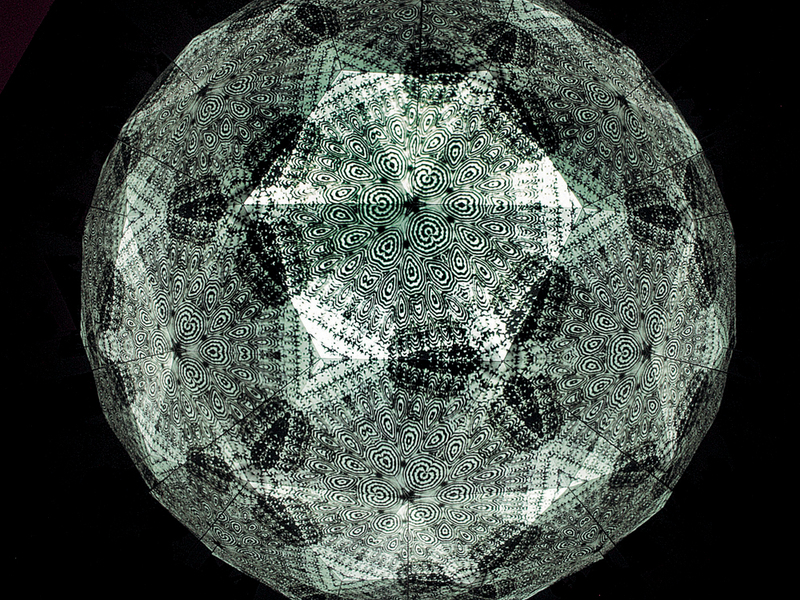 When David Brewster invented the kaleidoscope in 1816 he created geometric imagery with light. The geometric art that followed played on the idea of the symmetrical. However, more recently some artists prefer to disorientate the viewer with their abstraction. Whatever happened to geometric abstraction? Previously seen as the reassuring space of ordered, rational certainty, or reason and progress on the march, the world of abstract art seems to have plunged permanently into a chaos of uncertainty. If the geometric order that it represented had taken over from perspective as a symbolic form, the space that it rationally defined appears to have been shaken once more. The urban order of Mondrian’s ideal city has been replaced by disintegrating urban reality, or the shaped chaos of John Tremblay’s Drop City 2003 and Urban Unplanning 2000. A French historian by the name of Michel Gauthier has put forward the idea (in L’anarchème, éditions mamco, Geneva, 2002) that a considerable proportion of recent art could be characterised as a progressive effort to move towards defocusing, in contrast to earlier art, which was geared towards the definition of a focal point in painting. Historically, monochrome painting, or all-over abstract compositions, in which no single element of the composition is given more importance than any others, bore the mark of a desire to break down the hierarchy of the elements. That desire may be understood, on a symbolic level, as an anarchic effort to abandon the whole order on which older art was based. But if the opposition of figure/ground no longer structures the painting, that function has shifted instead to the relationship of painting/wall. The painting acts as a figure on the ground of the wall. Pollock and Newman compensated for this shift within the figure/ground dialectic by enlarging the format until it covered the wall almost entirely. 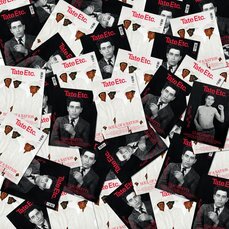 The extension of the work into the space was pursued literally by artists such as Allan Kaprow, who extended this dynamic beyond the bounds of the frame of the painting, producing the first environments – another way of contesting the focal position of the work within the exhibition space. 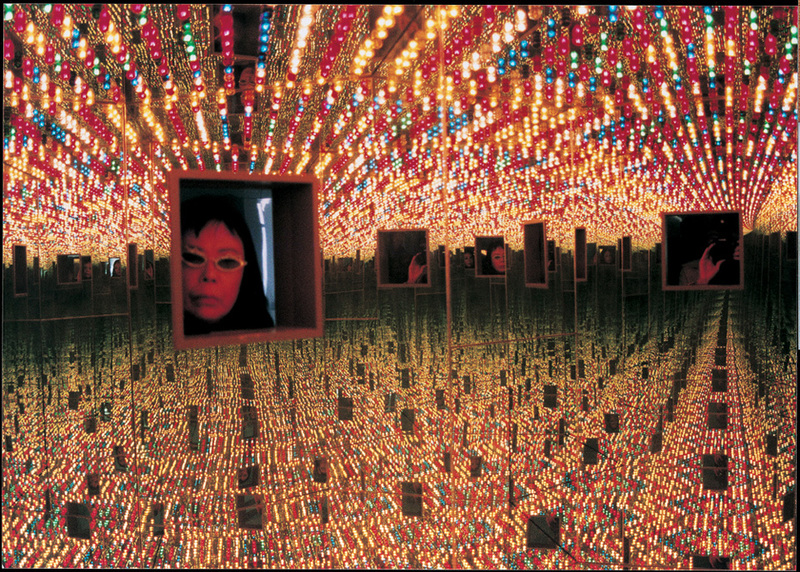 At roughly the same time, Yayoi Kusama was making her first installations based around plays of mirrors and lamps, with, for example, Endless Love Show (Castellane Gallery, March 1966; a work reconstructed in 1996 under the title Infinity Mirrored Room – Love Forever), a hexagonal box on a human scale, with two small openings pierced in it for the eyes, and the inner walls (including the floor and ceiling) completely covered with mirrors. Viewers can see their reflection infinitely multiplied, while at the same time bulbs in five colours fixed to the ceiling go on and off at short intervals, creating colourful combinations and changing shapes, like a kaleidoscope. A finite box containing an infinite vision, the installation at first produces a reduced image of itself before making it disappear into the distance created by its mise-en-abyme. This principle of depersonalisation through multiplication creates the sensation of being only one part of the whole of our environment. The work moves from a closed world with perspective as its corresponding symbolic form, to an infinite world with a corresponding form that is kaleidoscopic in nature. This pulverisation of the focal point by the kaleidoscopic image pursues the anarchical quest for an absence of hierarchy, not just between the different elements of the composition (which acquire greater equality by virtue of being identical, duplicated, literally reproduced by the reflections), but between the work and its space. Placing the viewer at the centre of the image is another way of attaining that goal. The same process is also at work in Carsten Höller’s minimalist menagerie Neon Circle 200), which resembles a hypnotic circular cage whose bars are animated by a permanent optical movement, at the centre of which the viewer is able to see the piece as a complete environment. Jeppe Hein’s Simplified Mirror Labyrinth 2005 forms another kind of comparable space that is also highly representative of the contemporary desire to disorientate the viewer. The goal of abstraction, whose aims were so often rationalistic, appears to have changed. The order of geometrical painting is breaking down. It seems as though it’s now more a question of losing the viewer than of giving him a set of bearings or helping him to order his perceptions. That is, for example, the implicit function of John Tremblay’s unshaped targets, or the soft paintings of Philippe Decrauzat (such as 2005’s Mae West, which can be seen as a melted Stella, like Dalí’s soft objects), or all the anamorphic paintings based on Ian Sommerville’s Dream Machine. These act as a distorting mirror to the history of abstraction - a mirror with multiple facets, as in Tremblay’s Disco-Up 1998, which is like the planispheric flattening-out of a mirror-ball. The loss of bearings implied by these works also relates to the kaleidoscopic in a second meaning of the word, a figurative one this time: the “swift and changing succession of impressions or sensations”. Paintings such as Alex Brown’s Alice 2005 create an impressionistic cartography of the contemporary digital landscape: those walls of images, the sequence of TV commercials, the constant visual bombardment that we face today. And the loss is not merely optical or retinal, as in the case of Op Art. It also includes within both its conception and its content the social effects of Op Art – its transformation or passage from the realm of art to the universe of pop culture, a re-reading of Op Art through its uses outside of the art world: television formats, cinematic special effects, record sleeves, fashion, interior design. Jim Isermann’s work is particularly emblematic of this. 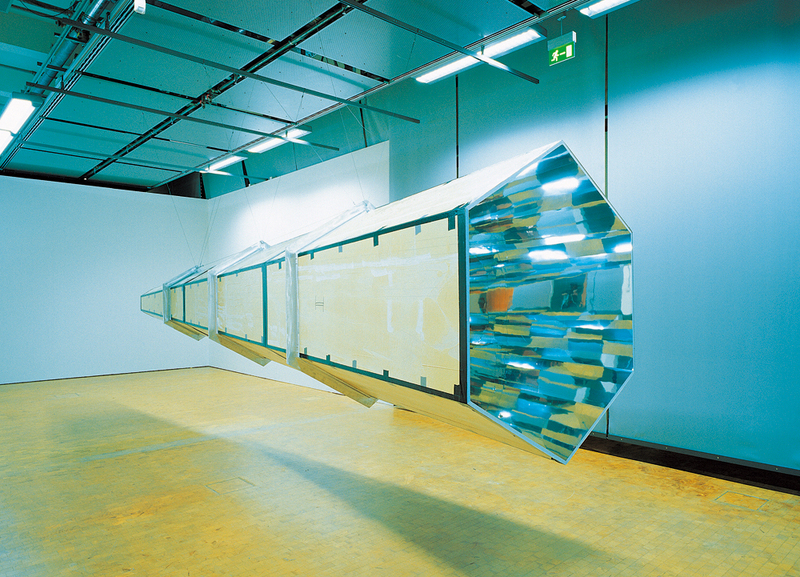 Vega 1999, his installation at the Magasin in Grenoble, was at once a homage to neo-Constructivist art and to its corruption into design and decoration – reinterpretations of Vasarely as wallpaper, or psychedelic sub-products. In his recent paintings Alex Brown often uses an image with another one showing through it, like a mirror in which other realities are reflected, a world seen through a kaleidoscope of superimposed images filtered by one another. 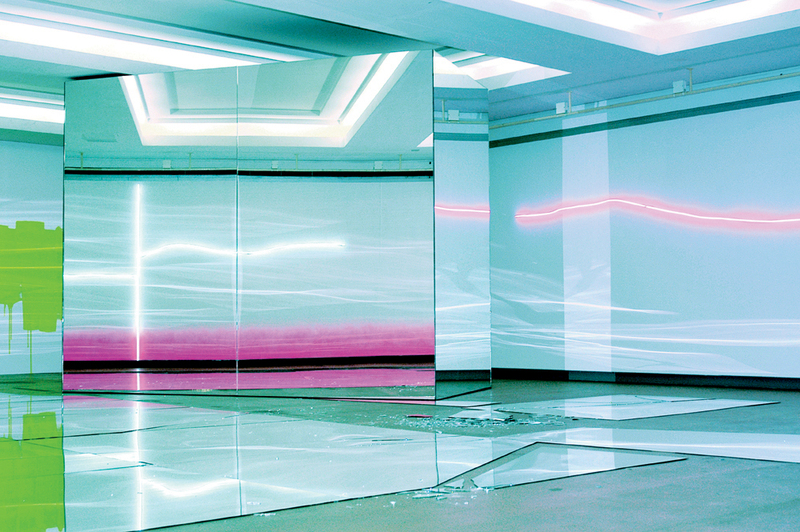 In 1966 Robert Smithson wrote an article entitled “The Crystal Land” in the May issue of Harper’s Bazaar (reproduced in The Writings of Robert Smithson, 1979) which is like the informal programme for this process, embracing the two possible meanings of kaleidoscopic – simultaneity and temporal sequence. The essay is itself kaleidoscopic, thoroughly representative of its highly suggestive way of reasoning, of superimposing a priori realities that are very remote from one another. The crystal is seen as the image of the landscape and the associations reflected by it. The article was illustrated by one of Smithson’s sculptures, the mirrorised plastic and steel Untitled 1965, evoking that crystalline structure, with the image of the artist reflected in it. Like a piece of stealth plating, the sculpture sends the eye in all directions except that of the object itself. Smithson notes in a letter: “Sometimes I think the whole universe is a Hall of Mirrors. Reflections reflecting reflections.”Taking both senses of reflection – mirroring and thought – the kaleidoscopic image forms a model for contemporary abstract art. No-one (to my knowledge, at least) has ever written an article entitled “The legacy of Robert Smithson”, as Kaprow did with Pollock, but that legacy is apparent in the approach of many artists towards abstraction today, in which every abstract shape is like the unfocused manifestation of the surrounding world.